Saturday featured a little bit of a change in plans. You see our friend Jon is getting married this coming Saturday, and his bachelor party was Saturday. Our original plan was that Tony would go in the evening when I attended my friend Randine's blessingway. Friday night, Tony tried to get me to go for him turning the bachelor party into an all day event . . . let me just tell you, that didn't fly. Things could be described as . . . tense around our house lately. For two months straight either Tony or I were working on Saturday. Working consisting of Tony almost an hour away or me either at the hospital for an undetermined length of time or shooting a wedding. We can do the whole weekend warrior thing well, but not in conjuncture with Tony coming home between 7-8:00 each night. It's gotta be an either or, not late evenings and no weekends! There wasn't a lot of fun being had. There wasn't a lot of time even being spent together to lend itself to fun! Money was driving our decisions and clearly at this time, that additional dollar is not worth the stress on our relationship. So, I made the only decision available to change our circumstances, I quit the hospital photography. Last weekend was jam packed and Tony worked down south, so I had sooo been looking forward to spending quality family time together Saturday, at least for the day! Tony relented Saturday morning and while it rained drearily almost the whole time we were together I thoroughly enjoyed going nowhere and doing nothing with my family. It was so fulfilling to just be at home without obligations. Don't ask me how though, at some point Tony turned on The Fast and The Furious. This may be a little known fact on this blog, but anyone that knows me in real life knows that I have issues with watching movies. I may sit and watch tv shows for the same length of time as a movie, but not an actual movie. There's just too much commitment to a movie choice! And then we watched 2 Fast 2 Furious. Absolutely ridiculous, but I just have to laugh. I mean seriously, I've probably watched 6 movies so far this year and these two are included now. I told Tony that it was his fault if I dreamed of Paul Walker that night and he cast some serious doubts on the probability of a baby #2, by saying that he would be as well! Hah! That evening Tony brought Isaac to my in-laws as I went to my blessingway and he went to his bachelor party. I hate posting about the blessingway without posting my pictures, but unfortunately the computer was screwy last night and I wasn't able to upload them for access today. So, for the time being, I'll talk about the blessingway without them! Randine is a coworker who I've come to love from my previous position. As so many mother's who experience a traumatic hospital birth the first time, Randine has invested herself in the beauty of childbirth. She has acted as a doula, is studying to be a midwife and fully support the Trust Birth initiative. She is just an amazing resource and amazing friend. I'm thoroughly looking forward to the beginning of July when I'll be photographing her 2nd child's birth at her home. The blessingway is a spinoff of a Native American tradition and has been taken hold by both Christian and secular mothers as an opportunity to bless the mother and celebrate her upcoming birth. I had never heard of the event before Randine, so it was very fitting that I should attend my first in her honor! It was an intimate evening with 7 attendees and birth stories and an excerpt from The Red Tent were shared. Randine sat with her feet in a foot bath and received a foot massage and light neck massage in a supportive manner as we all chatted good naturedly regarding birth. We were also asked to write Randine a note to be placed in a scrapbook and sign up to deliver a meal if we were available after the birth of the baby (great idea!). We also had dinner together with a beautiful table set with a centerpiece of candles. There was one large pillar candle in the center with numerous medium sized candles surrounding. The significance of the large candle was that it was to be lit by Randine when she began labor, and everyone in attendance was to take a smaller candle and light it when notified of Randine's labor as a reminder to pray for her. I think it's just the neatest idea. It was such a beautiful evening! Sunday then we went to church together and when we came back we made use of the gorgeous day by packing up for a picnic. 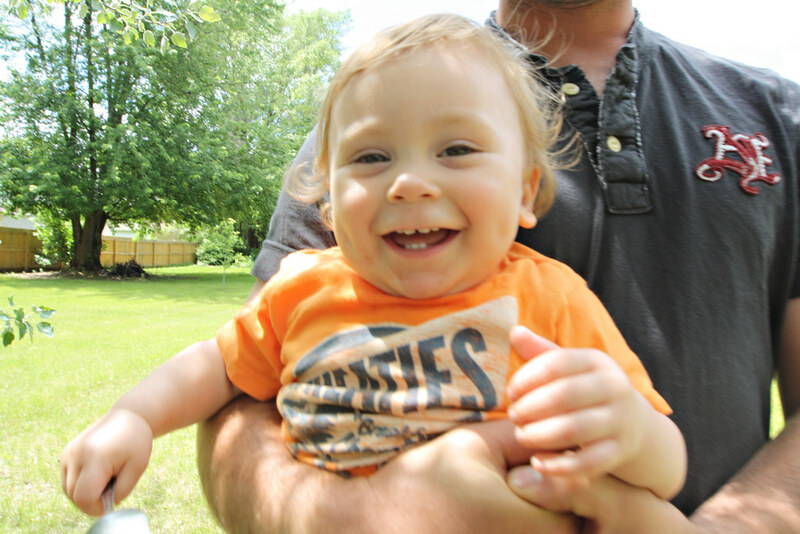 I must say, the original idea was to trek it to a nearby beach or park, but just as we were about to leave Isaac started getting extremely cranky. He has been battling his first year molars for a few weeks now, so I doped him up with some Walgreen's knock off Tylenol, love the recalls, and thought we should still make a go of it. Tony however disagreed and didn't think it would be a good idea to leave with Isaac as worked up and in pain as he was . 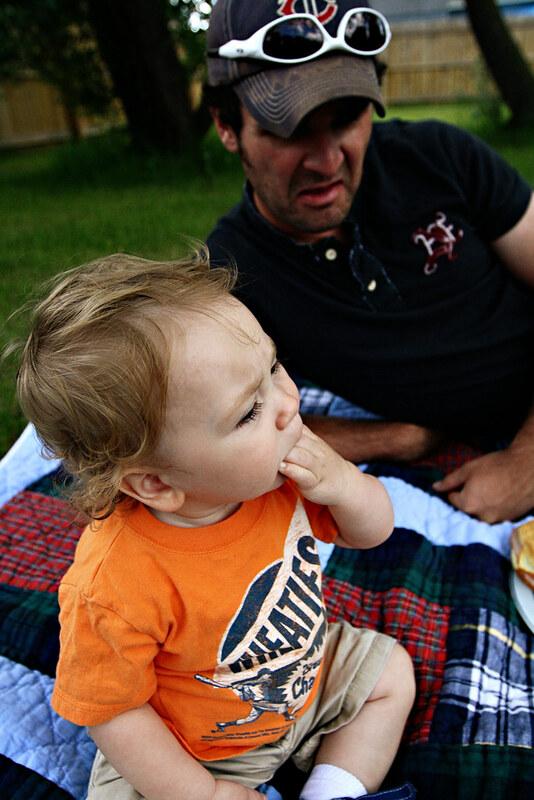 . . so, we had a picnic in our back yard! 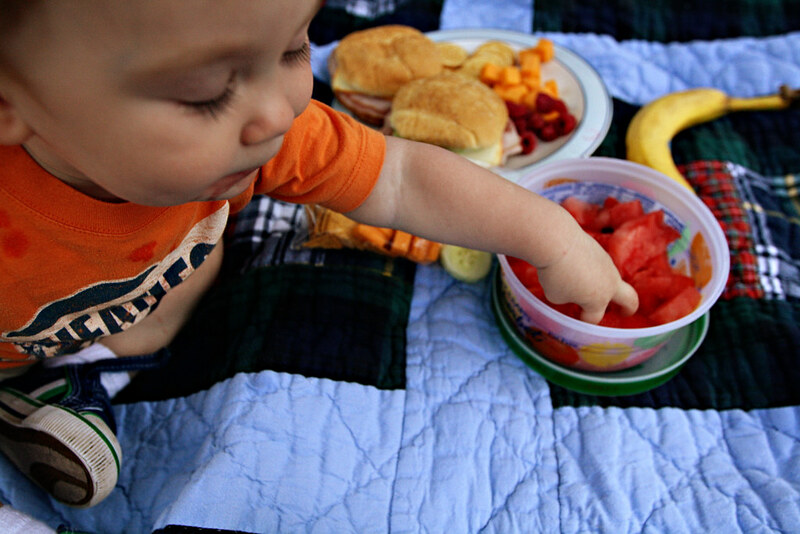 Isaac loved the cool watermelon on his gums and didn't think I was feeding him fast enough! Um, Tony's face says it all, but he doesn't like watermelon. The two times he's tried it he's thrown up! 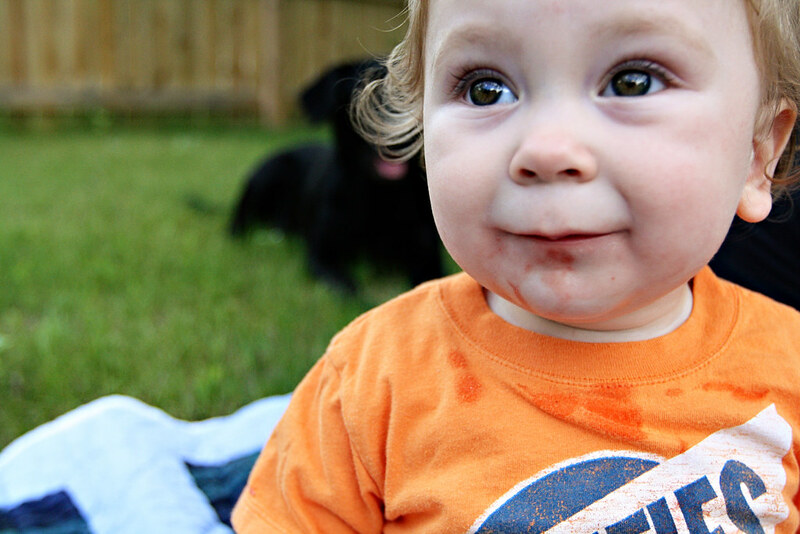 Summer = a fruit stained kid! I just love this picture. 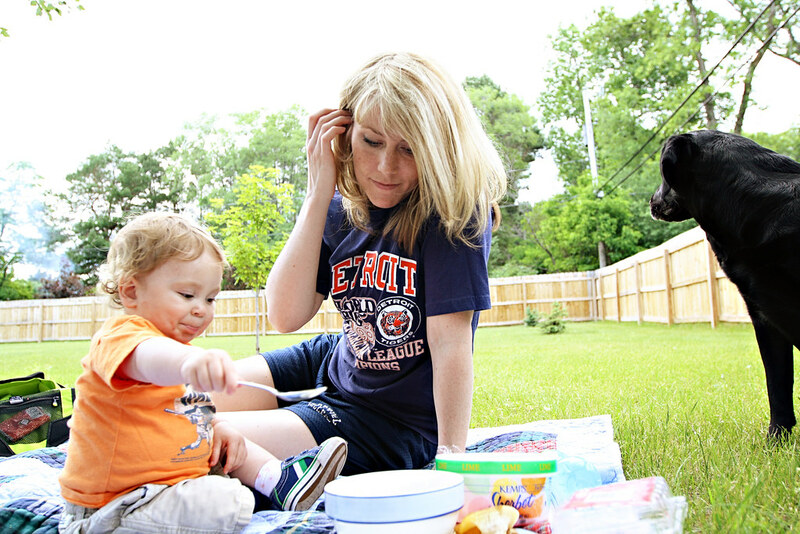 Knowing it's from Tony's perspective, in our backyard, happy child, Allie in the background! I just kind of, a little bit, love this kid. It was just such a great way to spend the afternoon! It was so cute how Isaac predominantly stayed on the blanket too. Just a few times he wandered off within the same section of the backyard and then he'd hurry back to us. Love. Oh my gosh, so much to comment on in this post!! First, huge props to you for recognizing that something needed to change regarding you and Tony's weekend/job status and then doing something about it. Second, the blessingway? Wow. Sounds so amazing!! What a unique and special way to celebrate a pregnancy. And you get to photography the home birth?? I'm so jealous!! That is going to be such an amazing experience. And so cool that Randine has become such an advocate for birth. I really feel pulled in that direction, but also feel like I need to wait until my family is a bit more established and our kid(s) are a bit older. Oh, and The Red Tent is a fave of mine. Last, the picnic. Amazing! Chad and I will totally be stealing this idea soon. And the shot of you with Isaac that Tony took? My gosh, what a perfect candid shot. 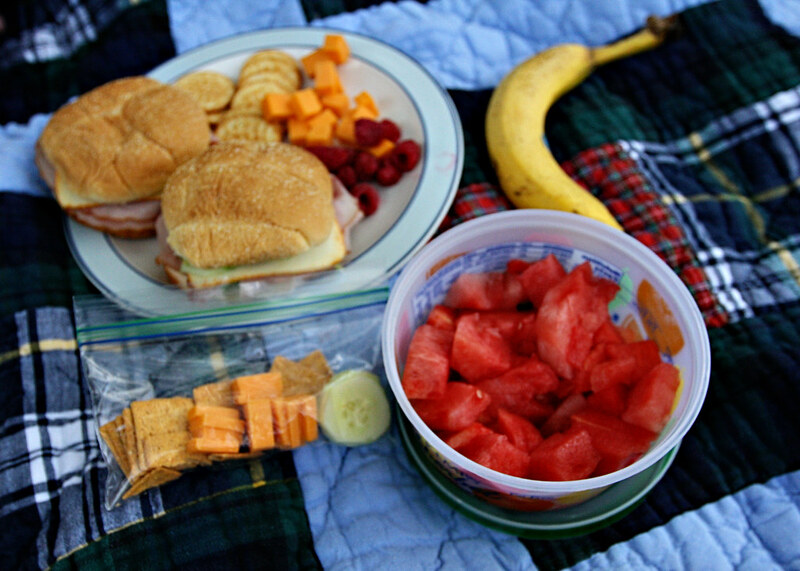 Love the picnic idea, how fun! We gave Kyle a little piece of watermelon the other day and he threw up, too. Clearly not a fan either. Ha ha! Your husbands face cracks me up! I love all these shots, and especially the last picture. You can completely see the love in your eyes for that little boy. How awesome that you get to photograph a home birth. I've always been intrigued by home births, and can't wait to hear your thoughts on it after you witness the process.